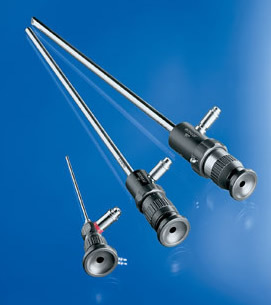 Karl Storz Mini Borescopes can reach inspection areas through holes as small as 1 mm (.025") in diameter. The bright images eliminate shadows and false indications to assure more accurate inspections as well as high quality images for documentation. Karl Storz mini borescopes feature diopter and focus adjustment to ensure high quality images and the ability to view a target regardless of its position in the image field. They are available with 0 degree to 70 degree direction of view and 40 degree to 90 degree fields of view.